In December 2018, my partner and I participated in a 5-day intensive spot repair course with Mitch Kohanek. We discovered Mitch on the internet and although we did our due diligence, we really did not know exactly what we were getting ourselves into. However, we found Mitch to be extremely informative, thorough, organized, and personable and a very thoughtful instructor. He established a baseline of our finishing knowledge and from there, put together a course that would add another creative dimension to our woodworking business and help to fast track our new touch-up business. He was encouraging and positive and when things took a wrong turn, he made it into yet another teaching moment. By the end of the week, we were reeling from the wealth of information and skill sets that we had explored. Mitch reviewed the material and made certain we had met our objectives and could hit the ground running when we returned to our shop. On our return, our first touch-up job was a huge $10,000.00 table… scratches on the bottom stretcher and touch-up needed on the underside of the apron…no problem for the newbies. When we arrived, the customer showed us two huge black blobs on the outside of one of the large turned legs that they wanted touched up as well. My first reaction was that I should call the office and say that this was way out of our league. Minny, however, nonchalantly mixed up some powders from her kit, did the touchup as Mitch taught us and, completely throwing caution to the wind, called the customer over. "Can you see it now? "she asked. Bending over and squinting, the customer said "No" with a smile on his face. There is no way she could have done it without our week of instruction from Mitch…he taught us well! The music Mitch played was soothing for the intensity of our learning; hot coffee or tea was always available to keep our energy levels up. It was an amazing opportunity to learn from a true finishing master. Do you want to take your finishing to the next level in your career path? My advice: sign up for an intensive with Mitch Kohanek. "I own a small custom cabinet shop in rural area, where taking my unfinished cabinets to a finisher is not an option, and I needed finishing techniques to match my building skills. After exhausting books and all the "wisdom" I could glean from the internet I turned to Mitch for help and we scheduled a two day private workshop. Mitch provided much more than the two day workshop though, he acted as a consultant before the workshop to determine and advise the best system and products for my operation. 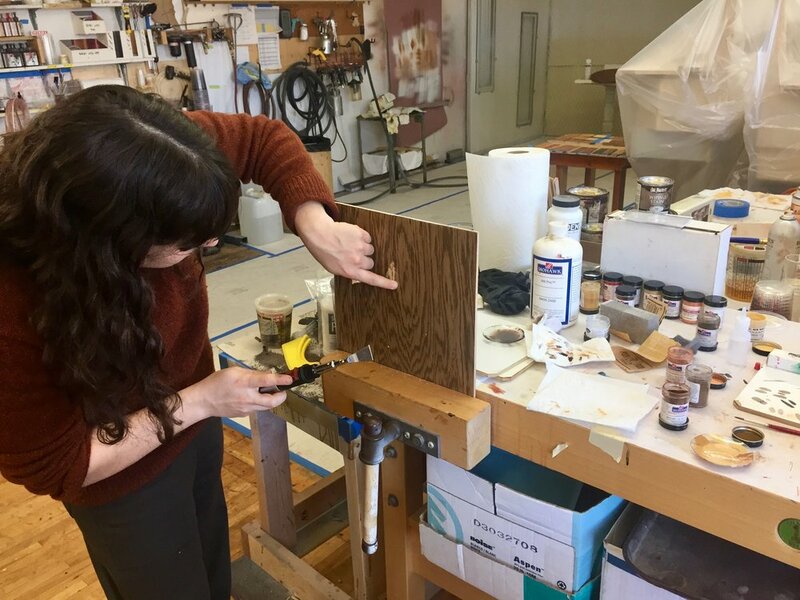 The workshop itself was a methodical practicum of all the products in my new, and much more efficient, finishing system — with an emphasis in understanding color and color matching. Although it's not possible to come out of a two day workshop an expert finisher, Mitch gave me a framework of understanding that has greatly accelerated my learning — saving me untold time and has taken my finishing to a new level." 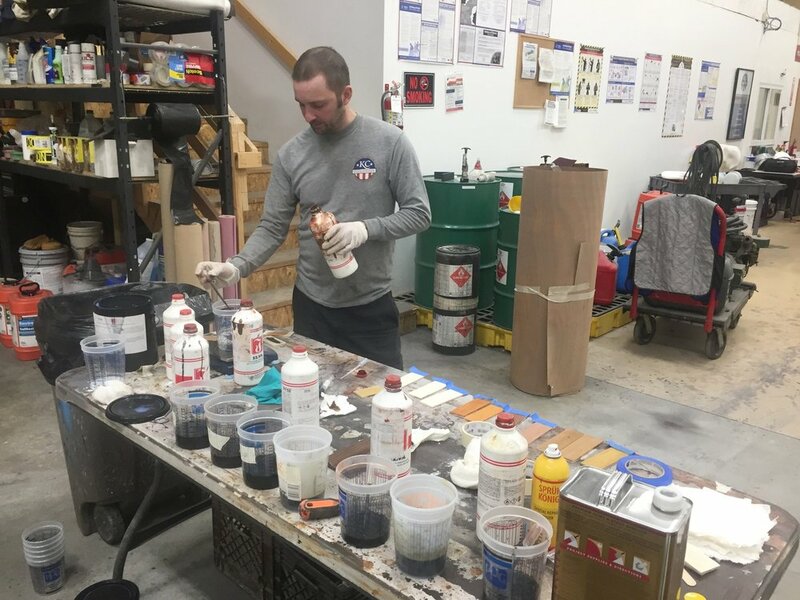 "Recently, I spent two weeks with Mitch learning about spot repair on wood furniture and found it to be some of the best money I've ever spent. It was comprehensive training on the repair of furniture which including using many products from Mohawk Industries and other manufacturers. The confidence I gained in understanding all the procedures and techniques for doing this is immeasurable. I developed the skills needed to understand the damage needing the repair and the approach to remedying it. Additionally, Mitch offered my a lot of insight and antidotes relating to this industry that will be quite helpful in my approach to marketing my business and running it effectively. I had originally scheduled three weeks with Mitch, but felt that after the second week, I was able to obtain everything necessary to move forward. I attribute this to Mitch's excellent instruction. I am very pleased with my time spent with a real expert in the industry. Thanks again, Mitch." "Let me start by thanking Mitch, a new friend, for sharing 2 days of intense wood finishing with me. Yes I said intense. The amount of information available to learn is unbelievable, and seemingly overwhelming. I started out by reading a finishing book, 3 times, by direction of Mitch, before showing up to the shop. I had a good concept of the terminology and basic understanding of what I was supposed to do to make the effect desired. And that is all I had after reading this very in-depth book 3 times! When I walked in to the shop. It is like a TV show of a true group of craftsmen. Hardwood floors, art hidden behind projects being worked on, and a robust coffee station with many choices to ensure everyone is caffeinated and ready to work. We sanded then talked stains and dies. Mixing color! Color Color Color. Unbelievable. And then how to layer color and color strike grain. Then we got into application of topcoats with and without color. Both with brush and gun. I brought my gun and we got it set to the most optimal shooting. And all along the way we discussed concepts while using them. I love this type of teaching because then I can adapt the knowledge to any situation. Basically every question I had Mitch didn't just answer he explained the concept and the why. Mitch is a great craftsmen and a better man. Thank you Mitch. Hope to see you soon." "I spent a couple of days training with Mitch in order to expand finish offerings in our custom furniture and cabinetry shop. It was definitely time well spent. Mitch fully customized the class to the areas I needed to focus on and made sure the learning was specific to the finish systems I was currently using. In the two days I was there, I gained a good foundation in color matching, custom finishes (glazing, toning, dyeing) as well as tips and techniques on gun and pump setup. Our finished product is seeing improvement and customers are remarking on our finishes and not just our design and woodwork." "In January, I spent three days working with Mitch, at his shop in St Paul, on specific questions about finishing that I had. It was great. Mitch was organized, knowledgable, and very easy to work with. Everything was hands on, the way that I like to learn. We covered all of my specific questions about finishing as well as some unanticipated area of finishing. In the past, I had tried to French polish, but I had never developed "the feel". After one morning with tips from Mitch, I experienced "the feel", the essential element of french polishing. I would highly recommend spending a few days in the shop with Mitch, to anyone who has questions about finishing. Your time will be well spent, and it will only serve to peak your interest in finishing." "I spent four days working with Mitch as training for my position in exhibits fabrication at the Smithsonian Natural History Museum. This was some of the most thorough instruction I have received, going over written information in books, powerpoint, and Mitch's own notes, followed by discussion and hours of hands on experience. Mitch listened to the specific needs of my shop, and set up examples and exercises accordingly. He presented me with many different tools and material, to help find the ones that worked best for my shop and made sure I left feeling comfortable using them. Mitch was patient, excited about all of my questions, and somehow crammed all his years of experience into four days. It was a blast!" "Mitch is a nice person with in-depth knowledge on wood restoration. Before designing a wood training program for you, he takes the time to find out your wood knowledge and experience. Mitch provides hands-on learning that is easy to learn and fun. 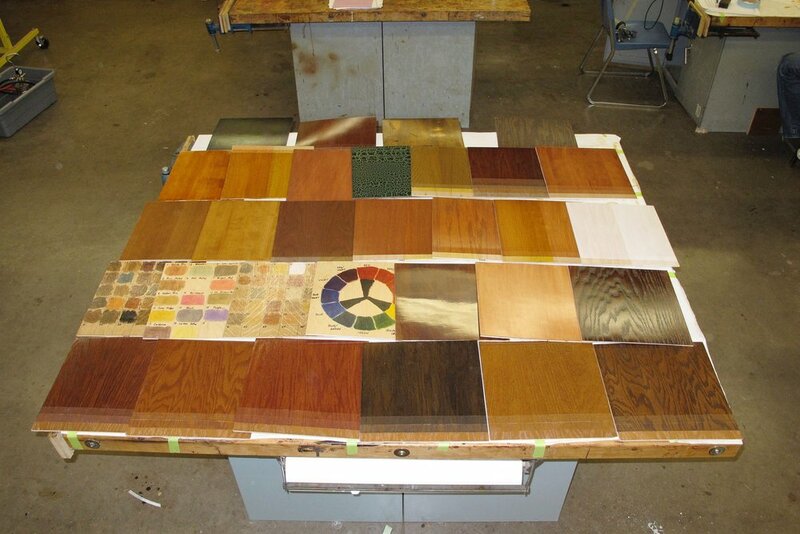 Because of the wood training I received from Mitch, I am able to simplify the color matching process, eliminate product waste, and have the confidence I need to execute a wood finishing job correctly."